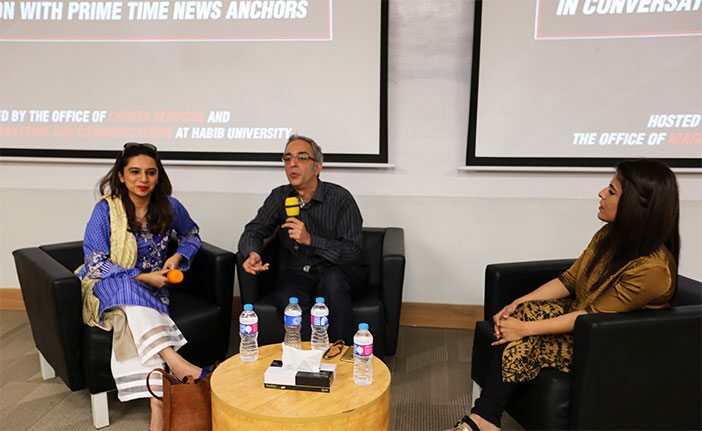 The Office of Career Services and the Office of Marketing and Communications at Habib University hosted an interactive informational session for HU students with leading broadcast journalists Maria Memon from ARY News and Zarrar Khuhro from Dawn News. 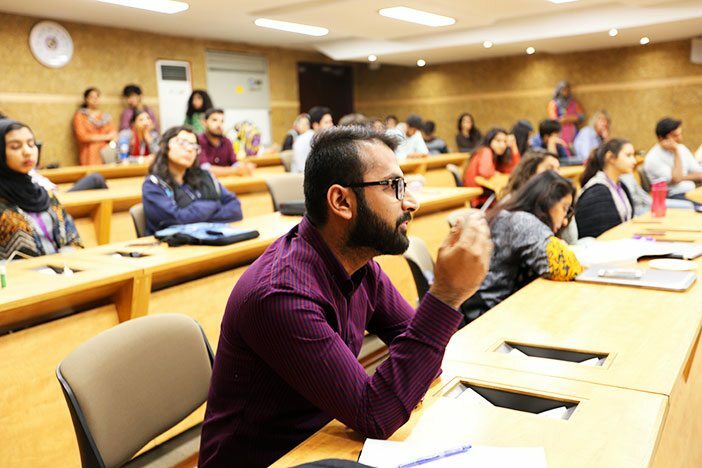 The session was geared toward students interested in pursuing a career in journalism and was held at the Soorty Hall on campus. The session began with Maria and Zarrar outlining their respective career paths, talking about the things they learned as they embarked on their careers, and then quickly moved on to take answers from the audience. They both discussed how they had not had any formal education in media, and learned on the job under excellent mentors. The audience mostly consisted of Communication and Design (C&D) majors interested in working in news media, all whom were eager to gain practical, real world advice about entering the often messy broadcasting industry. On the topic of mentoring, they talked about how they are always looking for young people to work with. “A person who is learned, who gets things done, who probably knows even more than me, I would really treasure him,” Maria said. Maria spoke about her experience as a woman in broadcasting, discussing how the glass ceiling prevents women from climbing further up the ladder, and noted that the lack of women bureau chiefs in the industry is because of a lack of focus. “And read a lot,” Maria added. “You have to do your research.” They both vehemently agreed that young people need to take initiative to get noticed and make a mark in the field. “You have to be persistent,” Zarrar colluded, saying that you have to do the grunt work and do it for years before you get noticed.